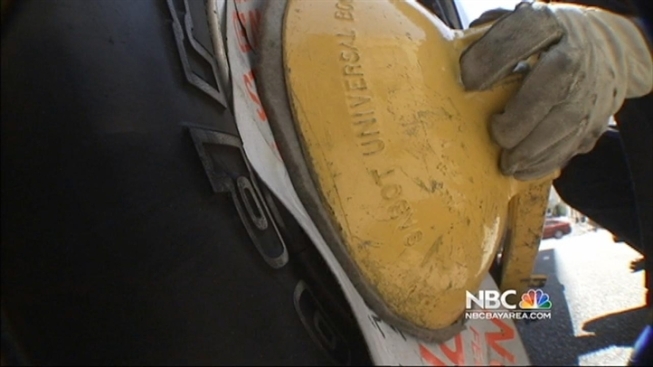 The NBC Bay Area Investigative Unit exposes millions of dollars of unpaid parking tickets in the Bay Area and goes undercover to track down the top offenders. Feed the meter or pay a steeper price: a parking ticket. In any downtown area, parking means paying, but the NBC Bay Area Investigative Unit uncovered some drivers dodging the law: parking wherever they want, for however long they want for free. It adds up to millions of dollars in unpaid parking tickets across the Bay Area. NBC requested records from Bay Area cities of all unpaid parking tickets over the last five years. Records show during that time period the city of San Francisco has an 88 percent collection rate and the city of San Jose, 85 percent. The amount that goes uncollected: the city of San Francisco has $132,066,977 in unpaid citations and late fees and San Jose has $15,227,151. In San Francisco, one top ticket-dodger owed the city $17,070. The vehicle is an Arrowhead truck registered to Nestle Water. The Investigative Unit followed the Arrowhead truck, driven by different employees, for several days in July and August, as it made its route dropping off water in San Francisco. NBC Bay Area cameras show the truck double parking, stopping in tow away zones and parking in metered spots without paying several times a day. On August 14, Investigative Unit cameras show the truck getting cited for parking at an expired meter. It’s not the only Nestle Water truck racking up tickets that the company had not paid: the Investigative Unit found the company owed the city of San Francisco $94,946 in unpaid tickets. Investigative Unit cameras show another Arrowhead truck registered to Nestle Water that owed $11,165 parking in a hotel loading zone. Another owing $12,722 parked in the middle of a busy street in the Marina, forcing several cars and cabled buses to take turns going around it. The Investigative Unit approached one of the drivers of the water truck owing the most money in unpaid tickets. When asked why he doesn’t feed the meter, he said “that’s a good question,” and told the Investigative Unit he has to find a place to park to do his job. When the Investigative Unit contacted Nestle Water, a spokesperson said Nestle was changing its policy to avoid a future backlog in parking tickets. She said the company would pay off the outstanding amount, but declined NBC Bay Area’s request for an interview. “You called them up and we got the check," Ed Reiskin, the director of Transportation in San Francisco, told NBC Bay Area. “We’re glad that they paid,” he said. The city of San Francisco uses booting and towing to deter drivers from ignoring tickets. A team of traffic officers gets an alert on a handheld device when a vehicle with five outstanding tickets gets another. Their job is to boot and eventually tow those offenders. However, the team didn’t catch a driver of a Honda that city records show owes $27,586 in tickets using a stolen license plate. In San Jose, the city does not boot or tow vehicles for outstanding parking tickets, but does use a collection agency and a state program called Tax Refund Intercept that will deduct the amount owed from an individual’s tax refund. NBC Bay Area found the car with the most tickets in the city of San Jose was a black Mercedes with a vanity plate reading: BELASKI. It’s the car’s registered owners’ last name. City records show the car's owners owe $17,194 in unpaid citations over the last five years. To view all of the car’s unpaid parking tickets, click here. The Investigative Unit watched the Belaskis’ car for several days in July as it parked in a two hour metered spot in front of the registered owners’ family-owned restaurant for hours, never feeding the meter. On July 16, the Unit’s cameras show a traffic officer on one day issuing the vehicle a citation. It is the car’s 200th ticket to go unpaid. California law says if a vehicle owner has outstanding tickets, the vehicle’s registration cannot be renewed until the tickets are paid. However the BELASKI car has a 2013 sticker. The Investigative Unit uncovered that registration sticker belongs to another car. The BELASKI car’s registration expired in 2010. When the Investigative Unit questioned Mrs. Belaski, that day she was in a new car. She denied who she was and said she did not drive a Mercedes. To view the unpaid citations of the top 100 offenders in the city of San Jose, click here. “Those methods in place did not stop that individual,” Jim Ortbal, director of San Jose’s parking program, told NBC Bay Area, referencing the city’s collection methods. “We have other methods that we are going to pursue and we are looking into them now,” he said. He’s talking about methods that may include taking civil action to collect parking fines in cases like the BELASKI car. Ortbal says his department is in talks with the City Attorney on implementing such methods to deter scofflaws.